How you gesture can make or break your presentation. If you’re nervous and use too few gestures, people in your audience won’t be inspired. If you use too many gestures, your hand movements will be a distraction. 1. Use gestures when speaking behind a lectern. If you don’t, you’ll risk appearing dull or nervous. 2. Open the palms of your hands when gesturing. You’ll come across as relaxed, and open and trustworthy. 3. Keep your hands strategically in front of you – from your waist to your shoulders. 4. Remember, though, to periodically let your hands drop down to your sides. That’s important most often if you feel the need to reboot your thoughts for speaking. 1. Don’t hold anything in your hands. If you do, people will be distracted and they won’t focus on what you’re saying. It also leads to fidgeting. 2. Don’t point your finger or a closed fist. Most likely, you’ll be perceived as too aggressive. 3. Don’t be careless in positioning your hands. Not to be gauche, but don’t position your hands clasped below your waist in your groin area. 4. Unless you’re already a trusted motivator as a public speaker, don’t make a fist and raise your thumb. That’s known as the “Clinton thumb.” It’s most often used by politicians. While less threatening than a clenched fist or pointed finger, it doesn’t add to your presentation and is considered to be trite. 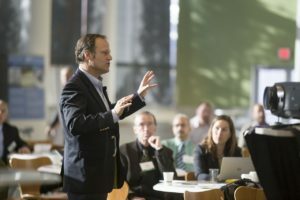 Success in Public Speaking Stems from Being Natural…Here’s How — Ever notice how some public speakers perform flawlessly? How they seem to be authentic, natural speakers? Our thought processes prevent us from becoming natural speakers, says Eric Stone, a leading expert in how to improve communication with others, public speaking and performance. Public Speaking: How to Earn Loyalty, Trust from Your Audience — For success in giving a speech, you must be able to bond with your audience. How? If you use a simple technique you can earn loyalty and trust with your audience members. Many speakers, however, overlook using the technique. How to Obtain the Most Profit from Speaking Opportunities — A strategic consultant to technology and media shares her secrets to making the most of your opportunities from a speaking event.